I have three more up by the bay window in my front yard, four-year-olds that are around three feet high, and they do a nice job of knocking your socks off from the street. What a plant. PJM is the hardiest of the many varieties of “Rhodies” that can be grown in the north, with bud tolerance to 25°-below zero. I think I did a little better than that one year, but mine grow in a somewhat protected area. They are one of the few broad-leafed evergreens available to northern gardeners, meaning they have leaves that do not die and drop in the winter. The PJM is particularly beautiful year-round, its dull-green leaves turning purplish in the fall. Rhododendrons need to grow in an acid, moist, light, well-drained soil with a pH between 4.5 and 6.5. In other words, if ever there was time you need to prepare the soil, this is it. Nearly all Rhododendrons grow and bloom best in shade to partial shade, which is why I love them. The one pictured will hit six-feet, about the tallest you can coax any Rhodie in the north. 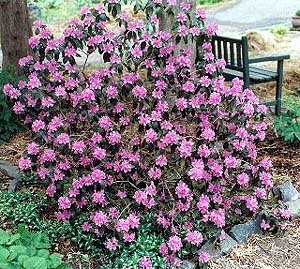 Rather than waste any more space here, refer to my column Growing Rhododendrons and Azaleas.